HARD SCIENCE MAGICAL GIRL, STARGAZER APOGEE! Okay, seriously. After reluctantly moving back to her closed-minded hometown, Callie Kendall befriends a two and a half foot tall mischievous alien, who's a sentient black hole in a containment combat suit. Now her small New England town has become ground zero for multiple extraterrestrial incursions and superhuman dangers. I'm also going to create a few mirror sites too. I'll let you know when I got those going too. So this was something I was hoping I could avoid. But apparently, life decided otherwise. I’ll be blunt. 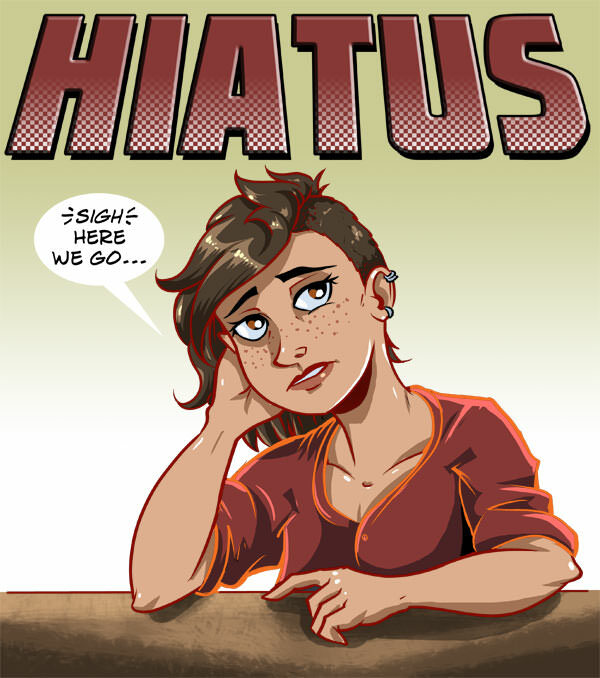 The comic is going on hiatus until at least sometime in March or so. Here’s what’s going on. I’ve mentioned that my fiancé Andrea (who is also the co-writer of the comic), we’re getting married as well as moving across state to Pittsburgh. We thought it’d be a lot more spaced out. However, due to her job requiring her to start a few weeks earlier than we expected… We’re literally getting married and then moving a day or two later. On this same note, I need to find a more stable source of income, because… Well, this ain’t exactly paying the bills. So I have to find work out there as well. Basically we have three major life events happening at the exact same time. Needless to say, we are stressed and freaking out like crazy. So like I said. Hiatus. And when we return, I’m going to try something I think is a little crazy. Hear me out here. My last webcomic, Shadowgirls, ended prematurely as well, on a cliffhanger with no resolution due to creative differences. I always hated that and I will be damned to let that happen again. I really like this story and we’re only just at the beginning of it. (We’re like already one sixth of the way through the first volume.) I want to see this through. So in March or so, things will hopefully have calmed down by then and I can resume production of sorts again. But one of the problems I think with telling a long form dramatic comic book as a webcomic is having to read each page a few day at a time. Let’s face it. If you’re taking your time with 16 pages to establish mood and tone is all neat, but in webcomics terms, that’s two months. I don’t know if I have the patience for that pace. And I’m the creator! This is not a unique complaint. How many people actually wait for a few weeks to read a comic in binge format? Quite a lot, I believe. We write these chapters in 12 page increments. When we come back, I’m not going to update the comic on a page by page basis anymore. We’re going to upload the entire chapter at once. Does that mean longer in-between updates? Yeah, it will. But I think it’ll be better for it. (Hey, a lot of us read monthly comic books. This hopefully will be no different.) Also, if I get to a page that requires a little more time on it? Then I can spend time on it, without feeling rushed for the update time. Now I do not know if anyone else has done this, and yes, I know the arguments against doing it this way. Hell, a few weeks ago, I would have agreed with them. But it’s an interesting experiment, and let’s be honest… I’m in an actual position to get experimental here. Now if you’re a follower of mine on Patreon, I’ll be posting the pages there as I complete them, and I’ll put them in the $1 category to boot. But eventually, you’ll get them here too. I apologize for this mess. I didn’t really plan things out as well as I would have liked. But hopefully you’re all cool with this and this will be better all around in the long run. Thanks for understanding and we’ll see you sometime in March or so. Howdy folks, we're going to take a week and a half break in-between chapters here. One is to catch up and get ahead so I don't blow through pages, and the other is to finish up a couple commissions I promised people I'd do. We're getting married AND moving across state in February and I'd like to have those obligations off my plate before it happens. (So with the upcoming chapter, there MIGHT be a missed update here or there. I'll let you know the update before though.) So I'm sorry in advanced for any delays. My name is Dave Reynolds, the creator, co-writer and artist of Stargazer: Apogee here. I'm a little late writing this up, but here we are. Hey there, to those who just stumbled upon the comic here. In case you're curious, Stargazer Apogee is under production and I'm looking to a late-November release date. The launch date will be November 28th, on a Tuesday-Thursday release schedule. It was originally going to be the 14th, but I moved it back a week to give me some breathing space. But then I realized that the week of the 21st was basically Thanksgiving weekend, and that wouldn't be too good as far as timing goes. So the set in stone date is the 28th.